There are a number of unique virtual reality accessories out there. Sure, there’s your standard ones like the Oculus Touch and Vive Tracker which have very obvious applications in VR. But then you have some more nebulous products like, for example, the Kortex. The device popped up on IndieGoGo and claims to help fight anxiety, manage stress and help you sleep better after using it for 20 minutes during your next VR gameplay session. 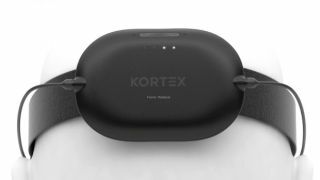 The Kortex straps onto any VR headset including the HTC Vive and Oculus Rift, though it looks like the Samsung Gear VR is where it will find the most success thanks to its low-cost ticket to entry. Back the device while it’s still on IndieGoGo and you’ll receive a discounted price and a copy of the game Land’s End. We’ll let you watch the video for more specifics, but the idea here is that the Kortex uses alternating current via an electrode strapped to your temple to stimulate the production of serotonin and reduce cortisol in the brain. Two 20-minute sessions a day and its creators, a medical technology company called Fisher Wallace Labs, say you’ll be sleeping better. While we don’t put a ton of stock in faux-medical devices, there are some potentially exciting applications here – either to enhance your mood while you play games or to help you wind down and relax when you’re feeling a bit too stressed out. Less anxiety and a free copy of a game? Sign us up.